Knoxville TN & Area Defense Attorneys | Booking & Arraignment | William C. Talman, P.C. Have you received a criminal citation with instructions to report for booking and processing? If so, then you HAVE BEEN charged with a crime. Do you know your legal and constitutional rights? IT IS ALWAYS IMPORTANT TO KNOW YOUR RIGHTS. YOUR RIGHTS ARE TOO IMPORTANT TO WAIVE OR GIVE UP SIMPLY IN ORDER TO GET SOMETHING OVER WITH OR TO AVOID THE EXPENSE OR INCONVENIENCE OF HIRING OR CONSULTING WITH A LAWYER. Non-criminal charges such as minor traffic offenses (running a stop sign, lane change violation, etc.) where you have been cited to a municipal or city court usually do not require booking and generally only involve the payment of a fine and possibly points against your drivers license. They do not ordinarily expose the offender to the possiblity of a criminal conviction or carry the possibility of jail time. HOWEVER, if you have received a criminal citation (also known as a misdemeanor citation) to General Sessions Court requiring booking and processing then, as previously stated, you HAVE BEEN charged with a crime, which carries the possiblity of a criminal conviction on your permanent record as well as the possiblity of jail time, probation, community service, and the payment of fines and court costs. While Police officers may arrest any offender for offenses for which a citation may be issued, often times in the discretion of the officer, or at the direction of a magistrate or judge on duty, a criminal citation may be issued instead. This happens generally when the offender has no prior criminal history, is not a flight risk, and does not pose a threat or danger to anyone or to the public in general. As previously stated, a criminal citation may be issued in lieu of arresting the offender for any misdemeanor offense (usually, class A misdemeanors like shoplifting, simple possession, possession of drug paraphernalia, underage consumption, which are just a few, or for any class B or C misdemeanors) in the discretion of the officer or at the direction of a magistrate or judge, but IT IS A CRIMINAL CHARGE - JUST AS IF YOU HAD BEEN ARRESTED, TAKEN TO JAIL AND THEN RELEASED ON BOND. Issuing a citation or summons rather than arresting an offender is merely trusting the offender to show up for booking and processing. In essence, you are being released on your own recognizance (or promise) to appear for booking, arraignment (initial or first court appearance), and any other court proceedings or as may be directed by the Court. Non-compliance or failure to appear at any scheduled event can result in your immediate arrest. While anything is possible, DO NOT THINK FOR ONE MOMENT if you only received a citation or summons with instructions to appear for booking that the matter is simple or there is nothing to it and it will simply go away by you appearing, admitting guilt or just telling your side. What CAN, and often DOES HAPPEN, is a criminal conviction on your permanent record that can stay with you for the rest of your life. Often times, people (especially first offenders and young offenders) believe because they were not arrested, taken to jail and made to post bond that the offense is just a simple matter. They often believe they will simply go to court, plead guilty or tell their side and only end up paying a fine and everything will be concluded and forgotten about. If you go to court on your own then you are representing yourself. Anything you say can and will be used against you by the prosecutor. Once a criminal conviction goes on your record - chances are it may NEVER come off your record. And once you plead guilty you generally cannot simply change your mind and do something else. When you appear for booking and processing, you will be fingerprinted, photographed and other personal information will be obtained. Usually this information is then placed in local, state and national criminal databases, including, but not limited to, the databases maintained by the Tennessee Bureau of Investigation and Federal Bureau of Investigation. These databases will list your charges as pending until a final disposition is entered. Even if somehow the charges should later be dismissed they will remain in these databases until such time as an order directing the expungement or destruction of the public records is entered by a court of competent jurisdiction. Expungement is a special process and is not automatically done by the court upon dismissal of charges. After you are fingerprinted and photographed, you will then be released and instructed to appear in court for an arraignment (initial or first appearance in court). It is possible the arraignment could take place almost immediately upon completion of the booking process. Please be aware if you miss, forget about, or otherwise fail to appear for booking at the scheduled time, or fail to appear at your scheduled arraignment, then you are subject to being arrested and held in jail pending your appearance before the court or required to post an appearance bond at the discretion of the court. At the arraignment, the court will advise you of your pending charges, your rights to a preliminary hearing, grand jury review of the charges, trial by jury, and will inquire as to whether you intend to represent yourself, hire an attorney of your own choosing, or apply to have the public defender's office appointed to represent you because you are either unemployed or lack sufficient funds (as determined by the court) to hire an attorney. If you choose to represent yourself and speak with the Assistant District Attorney General about the facts of your case then you need to be fully aware that the Assistant District Attorney General cannot give you any legal advice, cannot answer any legal questions or assist you in handling your case in any manner. It is the function of the District Attorney General's office to prosecute your case. Simply put, it is their job to convict you and to use any statements you make or evidence you provide against yourself in the prosecution of your case. If you go ahead and speak with the Assistant District Attorney General about your case, you will be asked whether you want to plead guilty to the charge(s). If you respond "yes", then you have admitted guilt and you are totally at the mercy of the prosecutor and the judge as to what punishment you receive. GENERALLY YOU CANNOT TALK YOURSELF OUT OF TROUBLE! You can, however, give evidence against yourself possibly making it impossible for any lawyer to be of assistance to you should you not like the outcome or punishment in your case. Usually, the best thing to do is KEEP YOUR MOUTH SHUT about the facts or details of your case until you speak with a lawyer who is representing you looking out for your best interests. Do not think you can simply show up, tell your side and then expect the charges to be dropped. It doesn't work that way. REMEMBER, once you plead guilty, it is done and you are generally stuck with the consequences. You cannot simply change your mind and then get a lawyer. It makes no difference under the law that you are not a trained lawyer, or that you are a first offender or that you are young (18 or over). It is not the function of the Judge or the prosecutor to give you legal advice or help you in any way (other than to advise you of your right to have an Attorney represent you). Representing you and your best interests is the function of your Criminal Defense Attorney. In our opinion, it is rarely in your best interest to simply go to court and plead guilty (even if you are guilty) as often times you may obtain a better overall result if you are represented by an Attorney. Certainly no guarantees can be made by any attorney regarding the outcome of a criminal case as each case is different and needs to be reviewed and evaluated on its own merits, facts and circumstances; however, in any event, you should at least consult with an attorney before going to your arraignment if possible so you know your rights, and have an idea what you are facing before you go. If you cannot speak with an attorney before going to your arraignment, then you should ask the court for time to do so before proceeding in your case. If you cannot afford to hire an Attorney then ask the court to allow you to apply to have the public defender's office appointed to represent you. It is our advice to NEVER represent yourself in court when you are facing any criminal charges regardless of how minor you think they are. If you are interested in scheduling a FREE consultation to discuss your case, then call our office at 865-633-9060, toll free at 800-759-1020 or by clicking here to request a consultation. 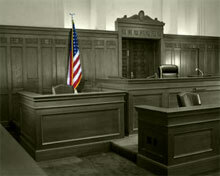 If you advise the court you intend to hire an attorney, or if the court appoints the public defender's office to represent you, or you advise the court you are going to represent yourself and plead NOT GUILTY at your arraignment then your case will be reset to a later date in the appropriate misdemeanor division of the General Sessions Court. ALL FELONY CASES and certain misdemeanor cases must be assigned to the appropriate division of the court and cannot be resolved at arraignment. The information presented on this page was directed primarily at those offenders receiving a criminal citation or criminal summons and does not cover every circumstance or situation. Persons are strongly encouraged to seek assistance and guidance of an attorney of their own choosing or to seek assistance from the office of the public defender if indigent and cannot afford to hire an attorney. The information provided herein is not all inclusive and does not cover every situation as each situation or case is different and unique. No information obtained on our site may be construed to constitute the giving of any legal advice or the formation of any attorney-client relationship. Persons are encouraged and admonished to seek legal assistance and advice from a licensed attorney of their choosing or from the public defender if indigent.